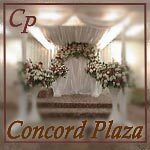 Renowned for their warm hospitable atmosphere and service, the recently redesigned Concord Plaza offers a wonderful menu, elegant decor, and very reasonable rates. Get more for your wedding! Don't forget to mention ChossonKallah.com when visiting Concord Plaza. Just two years ago we made our first daughter's wedding at the Concord. Everything was taken care of just as promised! Contrary to what everyone says about making a "frum" wedding...it was elegant, organized, all was done exactly as we hoped and best of all...simple to arrange thanks to their "package". We're now looking to make our second wedding there as well.